January 5, 1900: Yves Tanguy is born in Paris. 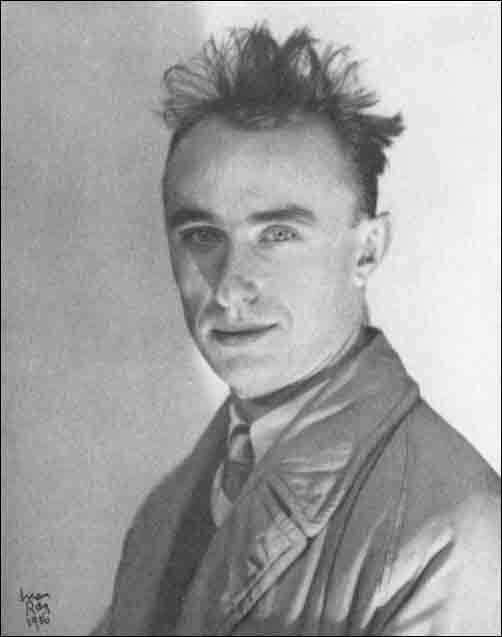 Surrealist Yves Tanguy, who would later be one of Arshile Gorky's neighbours in Connecticut, was born Raymond Georges Yves Tanguy in Paris to parents of Breton origin. January 31, 1900: Betty Parsons is born. Betty Parsons was born Betty Pierson in 1900 at 17 West 49th Street (now the site of Rockefeller Plaza) and was educated at the Chaps School and Miss Randall Keever's Finishing School. After seeing the Armory Show in 1913, she became interested in art and later studied sculpture with Gutzon Borglum (creator of Mount Rushmore). Her wealthy, conservative family disapproved of her following a career in art and was also opposed to women going to college. When Parsons was nineteen years old she married Schuyler Livingston. She left him three years later and went to Paris for a divorce. She stayed for 11 years, studying art (sculpture) and hob nobbing with the likes of Alexander Calder, Man Ray, Hart Crane, Max Jacob, Gertrude Stein, and Dada founder Tristan Tzara. In 1933 she returned to the United States (after the Depression wiped out her wealth) and first lived in Hollywood (where she met both Marlene Dietrich and Greta Garbo) before continuing on to Santa Barbara where she studied sculpture, gave art lessons, painted portraits and worked in a liquor store. After six years she returned to New York - a trip she financed by selling her engagement ring. After she exhibited some of her work at the Midtown Gallery in New York, she was offered a job as a salesperson. (The owner of the gallery was Mary Sullivan who, with Abby Rockefeller and Lizzie Bliss, founded The Museum of Modern Art.) In early 1940 Parsons started a gallery in the basement of the Wakefield Bookshop on East 55th Street showing Joseph Cornell, Saul Steinberg, Hedda Sterne, Theodoros Stamos and Adolph Gottlieb. In 1944 she was hired by Mortimer Brandt to open a modern section in his gallery of Old Masters. She showed Rothko's watercolours there in the spring of 1946. Brandt decided at the end of the 1946 season that modern art didn't sell and moved to a new location leaving his space at 15 East 57th Street which Parsons took over raising $5,000 - $1,000 of her own and $1,000 from each of four friends. (RO249-50) When Peggy Guggenheim moved back to Europe at the end of the 1947 spring season, Parsons took over her gallery space. Artists who would sign to Parsons gallery included Jackson Pollock, Mark Rothko, Clyfford Still, Barnett Newman, Ad Reinhardt and Theodoros Stamos. August 15, 1900: Jack Tworkov is born in Biala, Poland. Tworkov was the brother of artist Janice Biala. 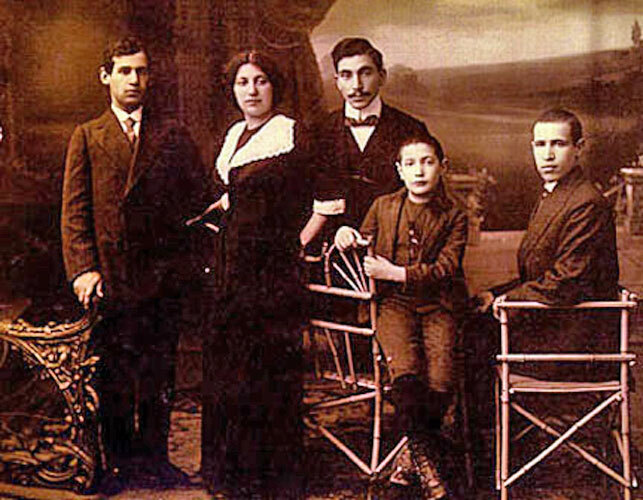 They immigrated to the United States as children in 1913. Tworkov was part of the WPA Federal Art Project from 1935 to 1941. From 1948 to 1953 he and Willem de Kooning had adjoining studios in New York. See Notes on Jack Tworkov. 1901: Valentine Dudensing is born. March 14, 1903: Adolph Gottlieb is born in New York. Gottlieb was born in downtown Manhattan. September 25, 1903: Mark Rothko is born in Dvinsk - at that time part of the Russian Empire, now Daugavpils, Latvia. Mark Rothko (born Marcus Rothkowitz) was the youngest of four children. His oldest brother was Moise, than a sister, Sonia and then another brother, Albert. April 24, 1904: Willem de Kooning is born in Rotterdam. See Willem de Kooning's childhood. September 23, 1904: Meyer Schapiro is born in Lithuania. Art writer and educator, Meyer Schapiro, immigrated to the United States at the age of three. (MX) His father had immigrated the previous year and after finding work as a Hebrew teacher arranged for his family to follow. In 1940 a dissident group led by Schapiro withdrew from the Artists' Congress because of their failure to condemn the invasion of Finland by Russia. Members of the dissident group, including Adolph Gottlieb and Mark Rothko, then went on to form the Federation of Modern Painters and Sculptors. In addition to writing about art in various publications including The Nation and Partisan Review, Schapiro was a professor at his alma mater Columbia University. He began teaching there in 1928. See Notes on Meyer Schapiro. January 29, 1905: Barnett Newman is born in New York. 1905: Misha Reznikoff is born in Kabilia, Russia. De Kooning biographers, Mark Stevens and Annalyn Swan, describe Reznikoff as "a perennial gadabout who knew everyone and kept abreast of the gossip." (DK254) Misha (sometimes spelled Mischa or Micha) arrived in the U.S. in 1921, studying at the Rhode Island School of Design and the Art Students League (where he befriended Stuart Davis). 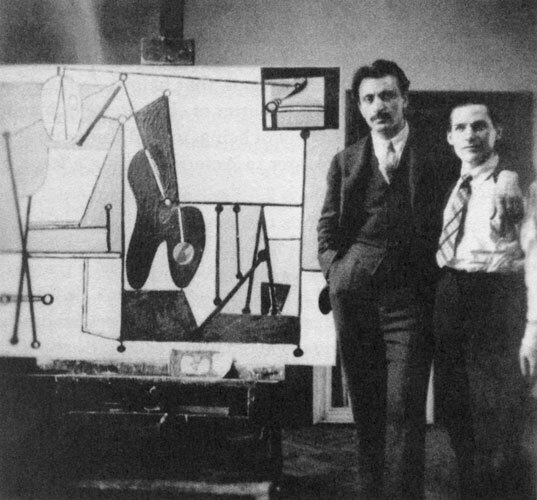 Reznikoff was an early friend of both Arshile Gorky and Willem de Kooning. He had first met de Kooning when de Kooning was working for a design firm, the Eastman Brothers, soon after de Kooning moved to Manhattan in 1927. (DK97) It was with Reznikoff's help that de Kooning landed a job teaching at Black Mountain College in 1948. 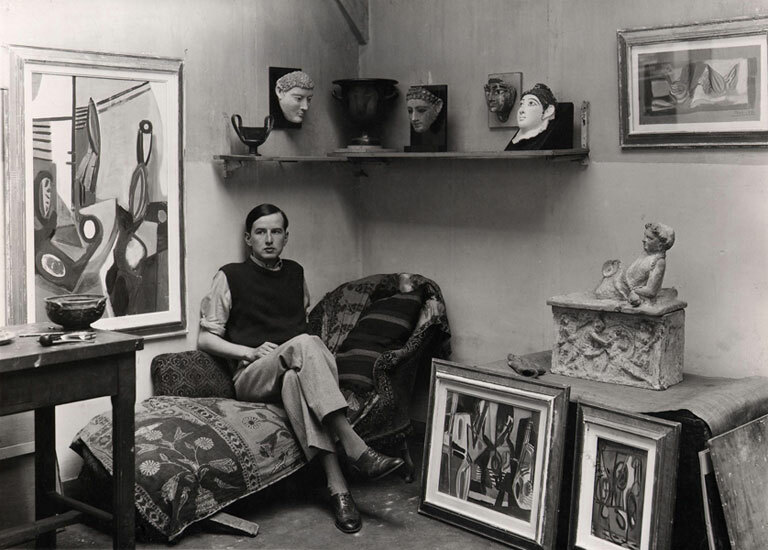 Reznikoff had asked the sculptor Peter Grippe (who ran the Atelier 17 print studio after its founder, Stanley William Hayter, returned to France) if he could do anything for de Kooning who was "down and out" and Grippes suggested de Kooning to Josef Albers who was organizing the summer session of Black Mountain. Reznikoff was married to Genevieve Naylor, one of the first woman photojournalists hired by the Associated Press. In 1940 Naylor and Reznikoff were sent to Brazil by the U.S. State Department's Office on Inter-American Affairs (OIAA) to photograph the country and promote American goodwill. The photographs taken by Naylor were exhibited in a one-woman show - rare for the time - at The Museum of Modern Art in New York and toured throughout the U.S. in 1944. In a review of a show by Reznikoff at Knoedler's, Clement Greenberg referred to Reznikoff as a "frail talent" but that his "decollages" ventured into "the more dangerous and exciting territory of the abstract." Misha Reznikoff, an American painter whose work is to be seen at Knoedler's, seems also a frail talent. But in his 'decollages' - which are large water colours that get their texture and some of their color from the effect left by peeling off various layers of the cardboard on which they are painted and then applying the color - Reznikoff ventures into the more dangerous and exciting territory of the abstract. Again, Reznikoff's talent is indisputable, and it shows to good effect in his two most abstract pictures - Brown Figure, which is a work of perfection, and Dances. Both of these are almost monotone in color and have a strength that is belied elsewhere in this show... His other paintings, though they seem so various among themselves in conception and design, are almost uniformly spoiled - some of them, like Party in the Evening and the Picassoid Masks, are just barely spoiled - by a decorative and faintly academic slickness and syrupy grace which in may cases ruin works that appear initially to have been well felt out. It is probably, however, that Reznikoff has it in him to say much more than he does in this show, and I look forward to his next. Reznikoff died in 1971 in New York. July 22, 1905: Wolfgang Robert Paalen is born in Baden, near Vienna Austria. In 1941 Motherwell studied with Paalen in Mexico for several months and Paalen encouraged Motherwell to collaborate with him on a new magazine he was planning named Dyn. He also introduced Motherwell to André Breton the same year. (CV). The first issue of Dyn was published in Mexico in 1942 and included Paalen's "Farewell au surréalisme." Only four issues of the magazine would be published from 1942 - 1944. During 1945, after the end of World War II, Paalen stayed with Motherwell during the summer and his book Form and Sense was published as the first book of Motherwell's Problems of Contemporary Art series. On the night of September 24, 1959 Paalen committed suicide in Taxco, Mexico after a long depression made worse by alcohol and drugs. October 17, 1905: John Ferren is born. John Ferren was the only American artist included in the opening show of Peggy Guggenheim's Art of This Century Gallery in 1942. He was one of the few American artists who had actually been to Europe by the time of the exhibition. He had traveled there in 1929, studying at the Sorbonne in Paris and briefly at the Universita degli Studi in Florence and the Universidad de Salamanca. He returned to the United States in 1930 (where he had his first solo exhibition at the Art Center in San Francisco) and then went back to Paris in 1931 where he participated in workshops at Stanley Hayter’s Atelier 17 before returning to the United States in 1938. Ferren was an active member of The Club when it first opened in New York. When Philip Pavia, who organized the events at The Club, relinquished his responsibilities in the spring of 1955, Ferren took over for about a year until Irving Sandler replaced him in 1956. Late 1905: The 291 Gallery opens at 291 Fifth Avenue, New York. Samuel Kootz, who would open his own art gallery in New York in April 1945 was a regular visitor to Stieglitz' gallery during the 1920s. February 2, 1906: Art writer Harold Rosenberg is born in New York. Rosenberg coined the term "action painting" in his article "The American Action Painters" in the December 1952 issue of Art News. (JP210/274n210). Although Jackson Pollock was not specifically mentioned in the article he assumed that Rosenberg was writing about him. Hans Namuth's photographs of Pollock energetically working on several paintings, including Autumn Rhythm: Number 30, 1950, had appeared in the May 1951 issue of Art News. Namuth's film on Pollock, which showed the artist painting on glass with the camera situated beneath the glass, had premiered at The Museum of Modern Art on June 14, 1951. October 18, 1906: James Brooks is born. James Brooks was born James David Brooks in St. Louis and studied art at the Southern Methodist University and the Dallas Art Institute. 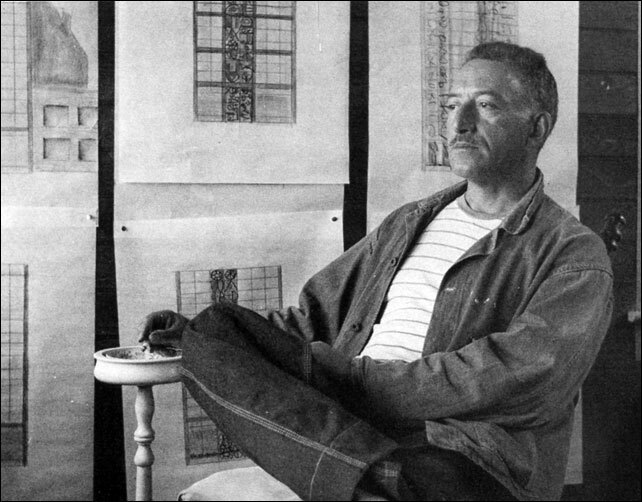 He arrived in New York in 1927, studied at the Art Students League while working as a commercial artist and joined the Mural Division of the Federal Art Project in 1936. He served as an art correspondent for the United States Army from 1942 to 1945. He died on March 9, 1992 after suffering from Alzheimer's disease since 1985. James Brooks, one of the last of the original generation of Abstract Expressionist painters, died on Monday at Brookhaven Memorial Hospital in Brookhaven, L.I. He was 85 years old and lived in Springs, L.I. He had Alzheimer's disease since 1985, said his wife, Charlotte Park Brooks. In his first one-man show at the Peridot Gallery in 1950, he presented stained and "dripped" canvases, influenced by his close friend Jackson Pollock, in which stains made on the reverse side of the canvas were used to generate "spontaneous" painted shapes on the front. In 1951, he participated in the historic "Ninth Street Exhibition," an artist-organized show that included the work of Pollock, Hans Hofmann, Franz Kline, Willem de Kooning and Robert Motherwell. In 1956, his work was part of the "Twelve Americans" show at the Museum of Modern Art, as well as the Modern's influential "New American Painting" show in 1959, which traveled through Europe. September 4, 1907: Leo Castelli is born. Art dealer Leo Castelli was born Leo Krauss in Trieste. His first passion was not art, but literature. Unfortunately, Hitler was also on his way. Drouin joined the French Army and Ileana and Leo retreated to the south of France. They escaped the German invasion of 1940 via a complicated route through Algeria, Morocco and Spain, finally arriving in New York in 1941. A year later they were living on the fourth floor of a town house at 4 East Seventy-seventh Street - a building owned and renovated by Ileana's father. From 1943 - 1946 Castelli served with the U.S. Army. After his stint in the Army he worked for the Paris Gallery as their U.S. representative. Among his clients were Baroness Hilla Rebay. During this time, he was also supposed to be working for his father-in law's subsidiary company, a sweater factory, but Castelli later admitted that his "heart and mind were elsewhere, either on East Tenth Street with the artists, or at The Museum of Modern Art." (AD84) In 1949 he ended his association with the Paris gallery - by which time he had got to know the art dealer Sidney Janis and many of the Abstract Expressionists. In 1950, he helped Janis organize the "Young Painters in the U.S. and France" and in 1951 played a key role in organizing the "Ninth Street Show." In February 1957, feeling that he "couldn't go on doing petty deals with Janis" he opened his own gallery in his apartment. In May 1957, Castelli put on an exhibition titled "New Work" which included a Jasper Johns flag and a Rauschenberg "Combine" painting (Gloria). In January 1958 hosted a solo show of Johns' work. Eventually he took on many of the Pop artists including Roy Lichtenstein and Andy Warhol. In 1959 Castelli and his wife divorced and she married Michael Sonnabend who she had first met in the 1940s when both were taking classes at Columbia University. As Ileana Sonnabend she opened a gallery with her new husband in Paris in 1962 with a show of Jasper Johns. She kept in touch with Castelli and showed many of the same artists. In the autumn of 1971 both she and Castelli opened galleries one floor apart at 420 West Broadway which, according to his The New York Times obituary, heralded "the arrival of the Soho gallery scene." Castelli died on August 21, 1999 at his home in Manhattan. The full name of the exhibition was "Paintings by Eight American Artists Resident in New York and Boston." The participating artists became known as The Eight and would later also be referred to as Ash Can painters or painters of the Ash Can school. In addition to the Macbeth Gallery, the exhibition was also shown in Chicago (at the Art Institute), Toledo, Detroit, Indianapolis, Cincinnati, Pittsburgh, Bridgeport and Newark and Philadelphia (Pennsylvania Academy of Fine Arts). (VA) The organizer of the show, Robert Henri (born Robert Henry Cozad on June 25, 1865 in Cincinnati, Ohio) had been a student at the Pennsylvania Academy of Fine Arts (beginning in 1886) and had previously exhibited there, including a solo show in 1897. Four of the members of The Eight had previously been known as the "The Four" or the "Philadelphia Four." The group consisted of four illustrators from the Philadelphia Press newspaper who gathered regularly in Robert Henri's studio in Philadelphia to discuss art and culture. They were: William Glackens, George Luks, Everett Shinn and John Sloan. (RF) Those four artists later became part of The Eight. The other four members of The Eight were Robert Henri, Maurice Prendergast, Ernest Lawson and Arthur B. Davies. Robert Henri had been spurred on to organize the exhibition of The Eight after a disagreement with the National Academy of Design where he had been elected an Associate Member in 1905 and an Academician in 1906. Henri was on the the jury for the Academy's annual exhibition in 1907 but walked out after accusing his fellow jurors of bias and unfair procedures. He withdrew two of his three entries from the exhibition and took his case to the press. (VA) The idea of staging an independent exhibition of The Eight was brought up at a dinner at John Sloan's house in March 2007. 1909 - 1912: Stuart Davis studies art at Robert Henri's school. January 16, 1909: Clement Greenberg is born in the Bronx, New York.